Flint is the county seat of Genesee County in the Flint/Tri-Cities region of Michigan. Genesee County comprises the entirety of Flint's metropolitan area, the fourth largest metropolitan area in Michigan with a population of 425,790 in 2010. The Saginaw Valley, particularly the vicinity of Flint, is considered by some to be the oldest continually inhabited area of Michigan. Regardless of the validity of this claim, the region was home to several Ojibwa tribes at the start of the 19th century, with a particularly significant community established near present-day Montrose. The Flint River had several convenient fords which became points of contention among rival tribes, as attested by the presence of arrowheads and burial mounds near it. In 1819, Jacob Smith, a fur trader on cordial terms with both the local Ojibwas and the territorial government, along with his Ojibwe wife founded a trading post in Flint itself. On several occasions, Smith negotiated land exchanges with the Ojibwas on behalf of the U.S. government, and he was highly regarded on both sides. Smith apportioned many of his holdings to his children. As the ideal stopover on the overland route between Detroit and Saginaw, Flint grew into a small but prosperous village, and incorporated in 1855. The 1860 U.S. census indicated that Genesee County had a population of 22,498 of Michigan's 750,000. Since the late 1960s through the end of the 20th century, Flint has suffered from disinvestment, deindustrialization, depopulation and urban decay, as well as high rates of crime, unemployment and poverty. Initially, this took the form of "white flight" that afflicted many urban industrialized American towns and cities. Given Flint's role in the automotive industry, this decline was exacerbated by the 1973 oil crisis and subsequent collapse of the U.S. auto industry. The long-vacant Durant Hotel was turned into a mixture of commercial space and apartments attractive to young professionals or college students, with 93 units. In March 2008, the Crim Race Foundation put up an offer to buy the vacant Character Inn and turn it into a fitness center and do a multimillion dollar renovation. On September 30, 2011, Michigan Governor Rick Snyder appointed an eight-member review team to review Flint's financial state with a request to report back in 30 days (half the legal time for a review). On November 8, 2011, Mayor Dayne Walling defeated challenger Darryl Buchanan 8,819 votes (56%) to 6,868 votes (44%). That same day, the Michigan State review panel declared the City of Flint to be in the state of a "local government financial emergency" recommending the state again appoint an Emergency Manager. On November 14, the City Council voted 7 to 2 to not appeal the state review with Mayor Walling concurring the next day. Governor Snyder appointed Michael Brown as the city's Emergency Manager on November 29, effective December 1. On December 2, Brown dismissed a number of top administrators including City Administrator Gregory Eason, Human Resources Director Donna Poplar, Citizen Services Director Rhoda Woods, Green City Coordinator Steve Montle and independent officials including Ombudswoman Brenda Purifoy and Civil Service Commission Director Ed Parker. Pay and benefits from Flint's elected officials were automatically removed. On December 8, the office of Obudsman and the Civil Service Commission were eliminated by Brown. On January 16, 2012, protestors against the emergency manager law including Flint residents marched near the governor's home. The next day, Brown filed a financial and operating plan with the state as mandated by law. The next month, each ward in the city had a community engagement meetings hosted by Brown. Governor Sydner on March 7 made a statewide public safety message from Flint City Hall that included help for Flint with plans for reopening the Flint lockup and increasing state police patrols in Flint. On March 20, 2012, days after a lawsuit was filed by labor union AFSCME, and a restraining order was issued against Brown, his appointment was found to be in violation of the Michigan Open Meetings Act, and Mayor Walling and the City Council had their powers returned. The state immediately filed an emergency appeal, claiming the financial emergency still exists. On March 26, the appeal was granted, putting Brown back in power. The city can appeal 21 days after that date. Brown and a several unions agreed to new contract terms in April. Brown unveiled his fiscal year 2013 budget on April 23. It included cuts in nearly every department including police and fire, as well as higher taxes. An Obsolete Property Rehabilitation District was created by Manager Brown in June 2012 for 11 downtown Flint properties. On July 19, the city pension system was transferred to the Municipal Employees Retirement System by The city's retirement board which leads to a legal challenge. On August 3, 2012, the Michigan Supreme Court ordered the state Board of Canvassers to certify a referendum on Public Act 4, the Emergency Manager Law, for the November ballot. Brown made several actions on August 7 including placing a $6 million public safety milage on the ballot and sold Genesee Towers to a development group for $1 to demolish the structure. The Board certified the referendum petition on August 8, returning the previous Emergency Financial Manager Law into effect. With Brown previously temporary mayor with the last few years, Brown was ineligible to be the Emergency Financial Manager. Ed Kurtz is once again appointed Emergency Financial Manager by the Emergency Financial Assistance Loan Board. Two lawsuits were filed in September 2012, one by the City Council against Kurtz's appointment, while another was against the state in Ingham County Circuit Court claiming the old emergency financial manager law remains repealed. On November 30, 2012, the State Treasurer of Michigan Andy Dillon announced the financial emergency is still ongoing, and the emergency manager is still needed. Michael Brown was re-appointed Emergency Manager on June 26, 2013, and returned to work on July 8. Flint had an $11.3 million projected deficit when Brown started as emergency manager in 2011. The city faces a $19.1 million combined deficit from 2012, with plans to borrow $12 million to cover part of it. Brown resigned from his position in early September 2013, and his last day was October 31. He was succeeded by Saginaw city manager (and former Flint acting mayor) Darnell Earley. The Flint River in the late 1970s during a U.S. Army Corps of Engineers flood control project, taken from approximately halfway between the Grand Traverse Street bridge and Beach-Garland Street bridge, looking east. The University Avenue corridor of Carriage Town is home to the largest concentration of "Greek" housing in the area, with fraternity houses from both Kettering University, and the University of Michigan Flint. Chapter houses include Phi Delta Theta, Sigma Alpha Epsilon, Delta Chi, Theta Chi, Lambda Chi Alpha, Theta Xi, Alpha Phi Alpha, and Delta Tau Delta Fraternities. Just north of downtown is River Village, a successful example of mixed-income public housing. To the east of I-475 is Central Park, a small neighborhood defined by culs-de-sac. Just north is Eastside Proper, also known as the "State Streets", an area that has recently diversified and has much of Flint's Hispanic community. The West Side includes the main site of the 1937 sitdown strike, the Mott Park neighborhood, Kettering University, and the historic Woodcroft Estates, owned in the past by legendary automotive executives and current home to prominent and historic Flint families such as the Motts, the Manleys, and the Smiths. The now-demolished Genesee Towers (left), and Mott Foundation Building (right). The Flint Journal's former headquarters are to the far left. Half of Flint's fourteen tallest buildings were built during the 1920s. The city's tallest building, the 19-story Genesee Towers, was completed in 1968. The building has become unused in recent years and has fallen into severe disrepair: a cautionary sign warning of falling debris was put on the sidewalk in front of it. An investment company purchased the building for $1, and it was demolished (by implosion) on December 22, 2013. Among other possible ventures, there are plans to relocate the local Flint Farmer's Market to the site. Flint lies within the humid continental climate zone (Köppen Dfb), with four distinct seasons. Summer is very warm and humid, with a July daily mean temperature of 70.5 °F (21.4 °C), and highs reaching 90 °F (32 °C) on about 9 days per year. Though days of 100 °F (38 °C) are rare, the record high is 108 °F (42 °C), set on July 8 and 13, 1936. Winters are cold and snowy, with a January average of 22.4 °F (−5.3 °C) and lows falling to 0 °F (−18 °C) or below on 9.3 nights a season. The lowest temperature on record is at most −25 °F (−32 °C), set on January 18, 1976. Though snow averages 48 inches (122 cm) per season, snow cover is not necessarily reliable and may disappear for short periods of time. Precipitation is greatest toward the end of summer. As of the 2000 census, there were 124,943 people, 48,744 households, and 30,270 families residing in the city. The population density was 3,714.9 per square mile (1,434.5/km²). There were 55,464 housing units at an average density of 1,649.1 per square mile (636.8/km²). The racial makeup of the city was 53.27% Black or African American, 41.39% White, 0.64% Native American, 0.44% Asian, 0.02% Pacific Islander, 1.11% from other races, and 3.14% from two or more races. 2.99% of the population were Hispanic or Latino of any race. 7.2% were of German and 5.6% American ancestry. 96.0% spoke English and 2.5% Spanish as their first language. As of the census of 2010, there were 102,434 people, 40,472 households, and 23,949 families residing in the city. The population density was 3,065.1 inhabitants per square mile (1,183.4 /km2). There were 51,321 housing units at an average density of 1,535.6 per square mile (592.9 /km2). The racial makeup of the city was 37.4% White, 56.6% African American, 0.5% Native American, 0.5% Asian, 1.1% from other races, and 3.9% from two or more races. Hispanic or Latino of any race were 3.9% of the population. Non-Hispanic Whites were 35.7% of the population in 2010, compared to 70.1% in 1970. The Michigan Warriors are a tier-A junior hockey team in the North American Hockey League. They are in their third season, and play their home games at Perani Arena, which has a seating capacity of 4,021, and 4,421 with standing room. In their inaugural season, they were defeated in the championship game. Attendance, however, has been a major obstacle for the Warriors. Although Flint does not have its own NBA team, it does boast that many of its local players have gone to the NBA or on to play Division 1 or European professional basketball. Glen Rice and Eddie Robinson both hail from Flint, as do Morris Peterson, Mateen Cleaves, and Charlie Bell (four of the five starters from Michigan State University's "Flintstones" 2000 National Championship team). A local teacher, turned independent film maker, Marcus Davenport chronicles Flint's ties to Basketball and the basketball culture in Flint Star: The Motion Picture, a documentary film Will Ferrell's 2008 movie Semi-Pro is based on the fictional basketball team the Flint Tropics. The 2009 Heisman Trophy winner Mark Ingram born and raised in grand blanc attended his final year of high school at Southwest Flint Academy, Flint. He beat out Stanford Running Back, Toby Gerhart and Texas Quarterback, Colt McCoy. He won with 1304 total votes. Mark Ingram attends the University of Alabama and is their first Heisman winner. He was a member of the National Champion 2009 Alabama Crimson Tide football team. Other athletes from Flint include Jim Abbott, Ron Pruitt, Rick Leach, Herb Washington, Don Coleman, Andre Rison, Andre Weathers, Mark Ingram, Sr., Todd Lyght, JaVale McGee, Brian Rolston, Booker Moore, Robaire Smith, George Hoey, Claressa Shields, Andre Dirrell, Anthony Dirrell, Chris Byrd, Courtney Hawkins, Carl Banks, Jeff Grayer, Darryl Johnson, Lonnie Young, Herb Orvis, John Thornton, Jon Runyan, Clarence Peaks, Eugene Marve, Mike Miller, Leo Sugar, Brent Williams, Dennis Johnson, Fernando Smith, Jim Morrissey, Brian Carpenter, Terry Crews, Ricky Patton, Daryl Turner, Reggie Williams, Paul Staroba, Demetrius Calip, Desmon Farmer, Terry Furlow, Roy Marble, Keith Smith, Barry Stevens, Scott Aldred, Joe Mays, Merv Rettenmund, Bob Powell, Mickey Weston, Steve Boros, Larry Mitchell, Jeff Hamilton and Bobby Reynolds. Residents are served by the Flint Police Department (with mutual aid from the Genesee County Sheriff's Department and Michigan State Police), the Flint Fire Department, and several private ambulance companies. Flint has its own 9-1-1 call center, which operates independently of Genesee County's call center in Flint Township. The Public Safety Director is Alvern Lock. On April 20, 2012, Barnett Jones was named the Public Safety Administrator (he resigned on January 10, 2013 after it was discovered he has a second job as chief security and integrity officer for the Detroit Water and Sewerage Department). Lock will remain the Public Safety Director. Brown revealed his Public Safety Plan on May 4, 2012. It includes increased partnerships with Michigan State Police, reopening the City Lockup, upgrading technology, a possible closure of the city's 9-1-1 center and consolidation with the countywide 9-1-1 center, and a new violent crime task force in partnership with the Genesee County Sheriff's Department. On November 6, 2012 Flint voters approved a 0.6% tax increase to be used for the police and fire departments. A week later on November 14, ten new police officers were hired. On March 11, 2013 the city hired seven police officers, raising its staff to 124 people. Flint Police Officers Union President Kevin Smith says more are still needed. Police Chief Alvern Lock agreed, saying the force needs at least 200 officers to get the crime problem under control. On July 24, 2013 after seven homicides in six days, the Michigan State Police announced it will transfer ten current officers and eight probationary officers to the Flint Post. The city's police department also announced it is in the process of hiring new officers. Later, on August 7, 2013 the department said it plans on hiring eight new officers after they graduate from Mott Community College's police academy in 2014. Lock resigned on September 27, 2013. His successor is former Detroit Deputy Police Chief James Tolbert. According to FBI statistics, Flint's violent crime rate has been in the top five among U.S. cities with a population of at least 50,000 people for the years 2007, 2008, 2009. In 2007 the FBI ranked Flint as the second most violent city in the U.S, while in both 2008 and 2009 Flint had the fifth highest violent crime rate. FBI data shows in 2009 Flint had 2,244 violent crimes, including 36 homicides, 91 rapes and 1,527 felonious assaults. While homicides and assaults increased in 2009, rapes and robberies decreased, contributing to an overall 3 percent drop in crime. On December 16, 2010, Flint's 64th homicide of the year occurred. "It's been a very difficult year," Walling said hours later. However, in dealing with the city's multimillion-dollar deficit, Walling laid off 66 police officers in 2010, including the 20 layoffs that took effect December 17, 2010. According to a study of FBI crime statistics by CQ Press, in 2010, Flint was named the "fourth most dangerous city in the United States." In December 2011, Flint rose to the number 1 spot on the "Most Violent Cities in America" list. According to a 2011 national poll by 24/7 Wall St. Flint was named the most dangerous city in the U.S. in 2011. On September 28, 2011 it was announced the Flint Police Department has been awarded $1,225,638 from the Department of Justice's Community Oriented Policing Services (COPS) program to re-hire 6 laid off patrol officers. The officers are scheduled to be on the job starting in October 2011. On December 19, 2011, it was reported that Flint's violent crime rate for the first half of 2011 was ranked No. 2 by the FBI, with St. Louis, Missouri taking the No. 1 spot. The report stated crime in every category, except motor vehicle thefts, was down as compared to the same period in 2010. On June 12, 2012, Flint took the #1 spot of the FBI's 2011 List of Most Violent Cities With Populations of over 100,000 people. The report stated Flint had 2,237 violent crimes (murders, rapes, robberies, and aggravated assaults) in 2011. It also stated Flint had increases in non-violent crimes (burglaries, larcenies, auto thefts, arson fires, and other property crimes). The next day, 24/7 Wall Street claimed Flint also made the #1 spot on a similar list, and stated in 2011 Flint had twice as many violent crimes (2,392) as those on their list of the "10 safest cities in America" combined (which in total was 1,246). Additionally, Flint had the most arson fires (287) in 2011 per capita per the FBI. In response, Governor Snyder again visited Flint on June 18, 2012 and announced he will send more state troopers to Flint, and give state money to Flint to run the city lockup. Additionally, on the same day, state representative Jim Ananich proposed the Michigan State Housing Development Authority give state money from the federal foreclosure benefit fund to the Flint Police Department to hire more officers. A month later on July 17, 2012 Ananich reiterated his push to secure those funds from the state, and also pointed out that scrap metal thefts are on the rise in the city, and proposed a portion of the $97 million fund be set aside to prevent them, which he claimed will also benefit the local economy by attracting new businesses to the city. On October 29, 2012, the FBI announced Flint is now ranked second in violent crime per capita of cities with over 50,000 residents, behind Camden, New Jersey. On December 30, 2012, Flint's 66th homicide of the year occurred, tying a record set in 2010. However on March 11, 2013, this figure was increased to 67 after a man who was shot in November died from his injuries. On June 4, 2013 it was reported the FBI has ranked Flint the most violent city per capita for the third consecutive year. According to FBI's statistics, Flint had more than 2,774 violent crimes in 2012. They included 63 murders, 108 rapes, 673 robberies and 1,930 aggravated assaults. However, the same report said non-violent property crime was down 14%, including a 21% drop in arson fires: 226 intentionally set fires last year compared to 287 in 2011. Additionally, auto thefts dipped from 770 reported thefts in 2011 to 459 in 2012. Burglaries dropped from 3,628 in 2011 to 2,979 in 2012, a 17% drop. Larceny-thefts increased from 2,200 to 2,207, less than 1%. In all, the city reported 5,645 property crimes in 2012, compared to 6,618 in 2011. Flint was named the "most dangerous city in America" by Business Insider in June 2013, based on FBI statistics. Kettering University is a four-year Science, Technology, Engineering and Mathematics (STEM) school. Mott Community College is headquartered in Flint with satellite campuses in nearby Fenton, Lapeer, Clio, and Howell. Flint is also served by Baker College's flagship campus in nearby Flint Township. Public K-12 education is provided under the umbrella of the Flint Community Schools. Students attend 14 elementary schools, and three high schools, which accommodate grades 7-12 (Flint Northern High School, Flint Northwestern High School, and Flint Southwestern Academy). The city's original high school, Flint Central High School, was closed in 2009 due to a budget deficit and a lack of maintenance on the building by the Flint School District. The building, however, still stands. Flint Northern High School was converted to an alternative education school at the start of the 2013-14 school year. The Catholic high school is Fr. Luke M. Powers Catholic High School which is part of the Roman Catholic Diocese of Lansing and serves the entire county. The school moved from its location in the north end of Flint in 2013 into the former Michigan School for the Deaf building off of Miller Road which received a $22 million renovation. WJRT-TV (ABC), formerly one of ten ABC owned-and-operated stations, is currently the only area station to operate from Flint. WSMH (Fox) and WCMZ-TV (PBS) are licensed to Flint, but their programming originates from outside of Flint proper, with WSMH originating from Flint suburb Mt. Morris Township (though its mailing address says Flint) and WCMZ rebroadcasting WCMU-TV of Mount Pleasant. WEYI (NBC), licensed to Saginaw, and WBSF (The CW), licensed to Bay City, has their studios in nearby Vienna Township, just north of Flint. Other stations outside the Flint area that serve the area include Saginaw-based WNEM-TV (CBS) (which has a news bureau in Downtown Flint), Delta College's WDCQ-TV (PBS), and Saginaw's WAQP (TCT). The city of Flint is served by various bus lines. For travel within and around the city, the Flint Mass Transportation Authority (MTA) provides local bus services. Greyhound Lines runs inter-city bus services north to Bay City and south to Detroit; and Indian Trails runs inter-city bus services west to Chicago. MTA's main hub is in Downtown Flint, while the Greyhound and Indian Trails station is located on Dort Highway, just north of I-69. Template:Jct/2 runs north and south through the southwestern part of the city. 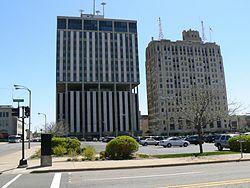 Saginaw Street runs north and south through the central part of the city, including the Downtown area. Amtrak provides intercity passenger rail service on the Blue Water line from Chicago to Port Huron at the border to Canada. The Amtrak station is located on Dort Highway, just north of I-69. Flint is served by several airlines at Bishop International Airport. It is located on Bristol Road between I-75 and I-69. Flint once had 2 other full service hospitals: St. Joseph's Hospital and Flint Osteopathic Hospital. They are now medical clinics which are part of the Genesys Health System, and currently referred to as Genesys East Flint Campus and Genesys West Flint Campus respectively with Genesys Regional Medical Center at Health Park located in Grand Blanc Township. Roger & Me (1989) Documentary about the economic depression in the Flint area caused by the closure of several General Motors factories in the late 1980s. Fahrenheit 9/11 (2004) Moore takes on the George W. Bush administration. Moore filmed students from Flint Southwestern Academy. Filmed Marine recruiters at Courtland Center and references Genesee Valley Center as a mall for more wealthy citizens, "The rich mall in the suburbs." ^ "City of Flint, Michigan". City of Flint, Michigan. http://www.cityofflint.com/default_vs.asp. Retrieved August 25, 2012. ^ Adams, Dominic. (September 11, 2013) Darnell Earley promises bold steps as Flint emergency manager. MLive Media Group: The Flint Journal. Accessed on October 18, 2013. ^ "Genesee County, MI official website". Gc4me.com. February 28, 2012. http://www.gc4me.com/. Retrieved May 21, 2012. ^ "2010 Census and Michigan Demographic Data". Michigan.gov. November 6, 2009. http://www.michigan.gov/cgi/0,4548,7-158-54534_51707---,00.html. Retrieved May 21, 2012. ^ "Detroit News, Rearview Mirror, ''The Sitdown strike at General Motors''.". http://info.detnews.com/history/story/index.cfm?id=115&category=business. Retrieved May 21, 2012. ^ Bjørnsson, Nils (1994) (in Norwegian). Å være eller ikke være – Under orlogsflagget i den annen verdenskrig. Haakonsvern: Sjømilitære Samfund ved Forlaget Norsk Tidsskrift for Sjøvesen. p. 23. ISBN 82-990969-3-6. ^ "Flint Cultural Center". Flintcultural.org. http://flintcultural.org/. Retrieved May 21, 2012. ^ a b c d e Mostafavi, Beata (November 10, 2011). "What happened last time? A look back at Flint's 2002 state takeover". The Flint Journal. http://www.mlive.com/news/flint/index.ssf/2011/11/what_happened_last_time_a_look.html. Retrieved December 5, 2011. ^ Longley, Kristin (November 8, 2011). "Flint would be only Michigan city to twice undergo emergency state takeover". The Flint Journal. http://www.mlive.com/news/flint/index.ssf/2011/11/flint_would_be_only_michigan_c.html. Retrieved November 14, 2011. ^ "What's Up Downtown?". http://www.whatsupdowntown.com. ^ "WNEM plans studio in downtown Flint". The Flint Journal. http://blog.mlive.com/flintjournal/newsnow/2007/09/wnem_plans_studio_in_downtown.html. ^ "Crim offers to purchase Character Inn". http://abclocal.go.com/wjrt/story?section=news/local&id=6028243. ^ Tom Leonard (June 12, 2009). "US cities may have to be bulldozed in order to survive". The Daily Telegraph. http://www.telegraph.co.uk/finance/financetopics/financialcrisis/5516536/US-cities-may-have-to-be-bulldozed-in-order-to-survive.html. Retrieved June 18, 2009. ^ Longley, Kristin (September 30, 2011). "Gov. Snyder appoints team to review Flint's finances under emergency manager law, requests report within 30 days". The Flint Journal. http://www.mlive.com/news/flint/index.ssf/2011/09/gov_snyder_appoints_team_to_re.html. Retrieved November 14, 2011. ^ Longley, Kristin (November 9, 2011). "About 19 percent of voters turned out to re-elect Flint Mayor Dayne Walling". Flint Journal. http://www.mlive.com/news/flint/index.ssf/2011/11/about_19_percent_of_voters_tur.html. Retrieved November 9, 2011. ^ Longley, Kristin (November 9, 2011). "Dayne Walling re-elected mayor as state declares financial emergency in Flint". Flint Journal. http://www.mlive.com/news/flint/index.ssf/2011/11/dayne_walling_re-elected_as_st.html. Retrieved November 9, 2011. ^ a b c d e f g Longley, Kristin (December 1, 2012). "Flint emergency: Timeline of state takeover". Flint Journal. http://www.mlive.com/news/flint/index.ssf/2012/12/flint_emergency_timeline_of_st_1.html. Retrieved 1 December 2012. ^ a b Longley, Kristin (November 29, 2011). "Former Acting Mayor Michael Brown named Flint's emergency manager". Flint Journal. http://www.mlive.com/news/flint/index.ssf/2011/11/former_acting_mayor_michael_br.html. Retrieved November 29, 2011. ^ Longley, Kristin (December 2, 2011). "Shakeup at Flint City Hall as new emergency manager issues layoffs, pay cuts". The Flint Journal. http://www.mlive.com/news/flint/index.ssf/2011/12/layoffs_pay_cuts_for_some_at_f.html. Retrieved December 5, 2011. ^ "Judge: State violated law in appointing Flint emergency manager; Powers of mayor, city council reinstated". The Flint Journal. March 20, 2012. http://www.mlive.com/news/flint/index.ssf/2012/03/emergency_manager_lawsuit.html. ^ "Flint, Michigan". SkyscraperPage.com. http://www.skyscraperpage.com/cities/?cityID=1064/. Retrieved May 21, 2012. ^ a b c "NowData – NOAA Online Weather Data". National Oceanic and Atmospheric Administration. http://www.nws.noaa.gov/climate/xmacis.php?wfo=dtx. Retrieved February 20, 2012. ^ "Station Name: MI FLINT BISHOP INTL AP". National Oceanic and Atmospheric Administration. ftp://ftp.ncdc.noaa.gov/pub/data/normals/1981-2010/products/station/USW00014826.normals.txt. Retrieved 2013-03-19. ^ a b "Flint (city), Michigan". State & County QuickFacts. U.S. Census Bureau. http://quickfacts.census.gov/qfd/states/26/2629000.html. Retrieved May 13, 2012. ^ "Michigan - Race and Hispanic Origin for Selected Cities and Other Places: Earliest Census to 1990". U.S. Census Bureau. http://www.census.gov/population/www/documentation/twps0076/twps0076.html. Retrieved May 13, 2012. ^ "Flint Star: The Motion Picture". Flintstarmovie.com. http://www.flintstarmovie.com/. Retrieved May 21, 2012. ^ "Catching up with Marcus Davenport maker of Flint Star "The Motion Picture"". Elevationmag.com. http://www.elevationmag.com/basketball/index.php?itemid=206. Retrieved May 21, 2012. ^ "Flint Tropics". Flinttropicsshirts.com. http://www.flinttropicsshirts.com/. Retrieved May 21, 2012. ^ "The History of Genesee County, MI. Chapter XIII: Early Years of Flint City". Usgennet.org. March 1, 2002. http://www.usgennet.org/usa/mi/county/lapeer/gen/ch13/earlyflint1.html. Retrieved May 21, 2012. ^ "Hon. William A. Atwood". 1892 Portrait & Biographical Album of Genesee, Lapeer & Tuscola Counties, Chapman Bros.. 1892. pp. 801–803. http://www.usgennet.org/usa/mi/county/tuscola/book/800-803.htm. Retrieved February 6, 2009. ^ "The Most Conservative and Liberal Cities in the United States" (PDF). http://alt.coxnewsweb.com/statesman/metro/081205libs.pdf. Retrieved May 21, 2012. ^ David Harris (September 17, 2010). "FBI statistics show Flint fourth most violent city in America". Flint Journal. http://www.mlive.com/news/flint/index.ssf/2010/09/fbi_statistics_show_flint_four.html. Retrieved October 19, 2010. ^ Drake, Proskin, & Crain. "Analysis of Flint Homicides". Center for Homicide Research. http://www.chronline.org/Flint%20Michigan%20Research%20Report.pdf. Retrieved December 31, 2010. ^ "Michigan School for the Deaf". Deaftartars.com. http://www.deaftartars.com/about.cfm?subpage=231935. Retrieved May 21, 2012. ^ Marjory Raymer. "Flint Journal: "Flint Journal to return to Newsstands on Tuesdays starting March 23", 3/7/2010". Mlive.com. http://www.mlive.com/news/flint/index.ssf/2010/03/flint_journal_to_return_to_new.html. Retrieved May 21, 2012. ^ "Broadside". Flintbroadside.com. http://www.flintbroadside.com/. Retrieved May 21, 2012. ^ "Innovative Health Magazine homepage". http://www.innovativehealthmagazine.com/. ^ "Downtown Flint Revival Magazine homepage". http://www.downtownflintrevival.com/. ^ WFLT AM 1420 Flint. "WFLT AM 1420 Flint". Michiguide.com. http://www.michiguide.com/dials/rad-d/wflt.html. Retrieved May 21, 2012. ^ "Flint Bishop International Airport". Bishopairport.org. http://www.bishopairport.org/. Retrieved May 21, 2012. ^ "About Sister Cities of Flint Michigan". Archived from the original on October 19, 2007. http://web.archive.org/web/20071019150808/http://www.visitflint.org/sistercities/About_Sister_Cities_of_Flint.htm. Retrieved January 25, 2008. This page uses content from the English language Wikipedia. The original content was at Flint, Michigan. The list of authors can be seen in the page history. As with this Familypedia wiki, the content of Wikipedia is available under the Creative Commons License.